Number 161 in the every growing CASA Working Paper Series is Building 3D Agent-Based Models for Urban Systems by A.T. Crooks, A. Hudson-Smith and A Patel in a collaboration between George Mason University, United States of America and here at Centre for Advanced Spatial Analysis (CASA), University College London. There is a growing interest in relating agent-based models to real- world locations by combining them with geographical information systems (GIS) which can be seen with the proliferation of geosimulation models in recent years. This coincides with the proliferation of digital data both in the two and three dimensions allowing one to construct detailed and extensive feature rich and highly visual 3D city models. This paper explores some of these developments in relation to our own initial work on building 3D geospatial agent-based models of urban systems and the technologies that allow for such models to be created. Furthermore, we highlight some techniques for the creation of 3D agent-based models and stress that such models are not a substitute to good models. 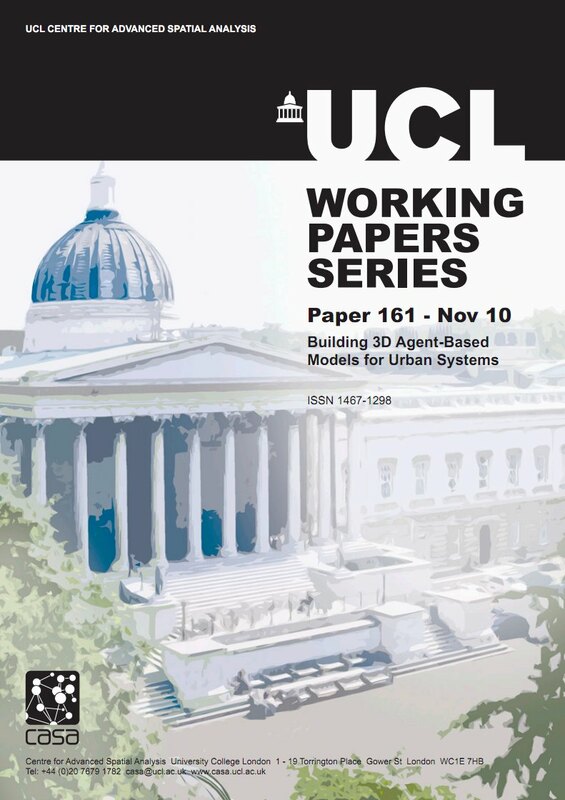 The intention of this paper is to explore the recent advances in computer technology, software and associated techniques that allow for the creation of 3D agent-based models which can be used to simulate various aspects of city life focusing on our own initial research of creating 3D cityscapes and 3D agent-based models. The remainder of this paper will therefore explore our attempts to use digital data to create feature rich 3D cityscapes (Section 2), discuss why such cityscapes are important for ABM (Section 3), before moving into how advances in computer hardware allow for the creation of 3D agent-based models (Section 4); we then briefly explore a potential application domain, that of pedestrian modelling (Section 5). Section 6 presents techniques which we are currently utilizing to create 3D agent-based models through various linking and coupling approaches along with advantage and disadvantages of each approach before a discussion is presented (Section 7). Download the full paper (748k pdf).